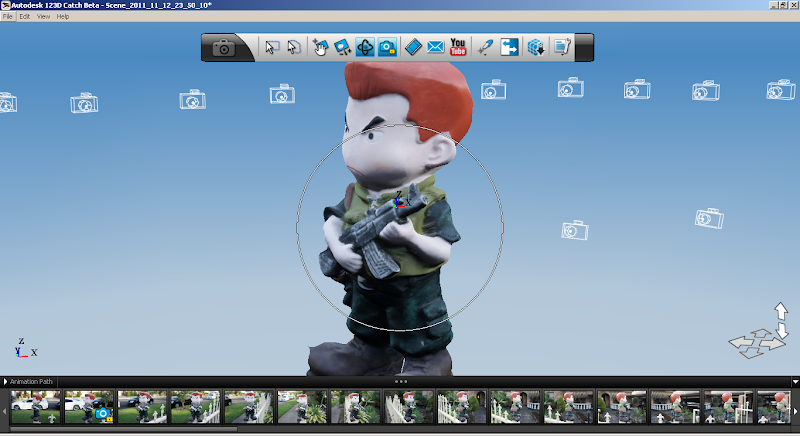 With the proliferation of home 3D printers, a lot of people ask ‘how do you create the 3D models to print?’. The answers are typically “I download it from Thingiverse…” or “I model it up using CAD myself” (My answer), the first isn’t that fun and the latter might be too hard for the non-technical crowd. 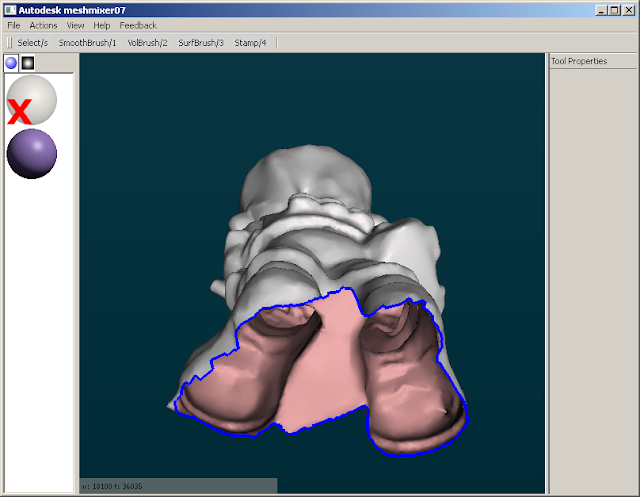 However all is not lost, quite recently a few services have popped up that offer Photogammetry where you can upload a number of photos and back comes a 3D model. There are a number of options but based off a chat while visiting Beehive Digital Manufacturing over the weekend I decided to give Autodesk’s Catch (was Photofly) another go so I can share the results on how easy it is to create a printable model. It is recommended that you set your camera to MANUAL FOCUS such that focus doesn’t change between shots, this helps the photogammetry algorithms. Take photos all around the object, say 20 photos for 360 degrees. Take note that unless you want the top of the head to be a gaping hole, it doesn’t hurt to take another round of photos (say 20 more) from a higher angle. 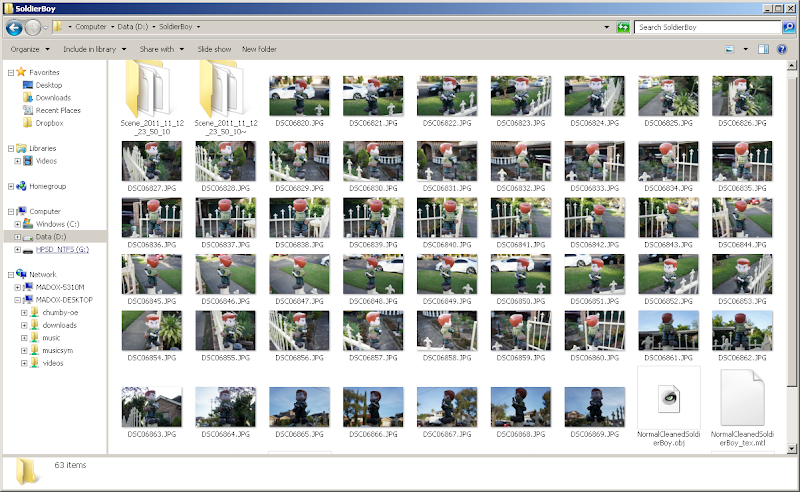 I took 50 photos for soldier boy, with extra shots from a low angle to capture features such as his bags and pockets. Presuming you have the program already installed, it is really as simple as selecting all the photos you’ve taken and hitting an upload button. There are some quirks with the program, mine crashed on the first attempt but retrying worked. You should get your ‘scene’ back to be opened using the ‘Scene Editor’. The scene editor allows you to preview your model, with some tools to tweak here and there. 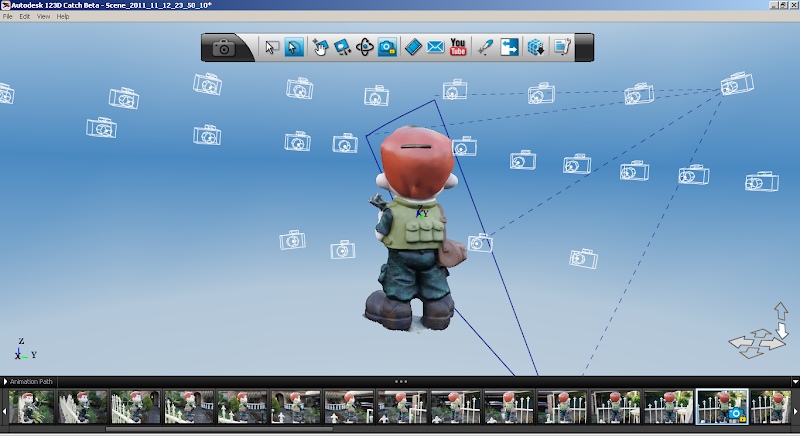 It shows you a textured model, and the positions it thinks you’ve taken the photos from. Assuming all is well, you shouldn’t need to edit any stitch points. 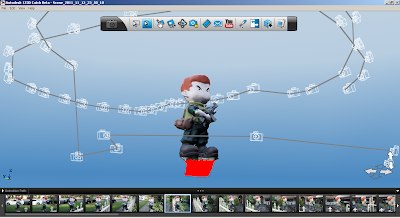 What is useful in the scene creator is removing obvious artifacts from the model, I ended up getting some extra fence spikes as well as the spike underneath his feet. Removal is easy, use the lasso select tool to select the parts you don’t want and hit delete. Give your mesh a quick look over to see if the quality is good enough for you. 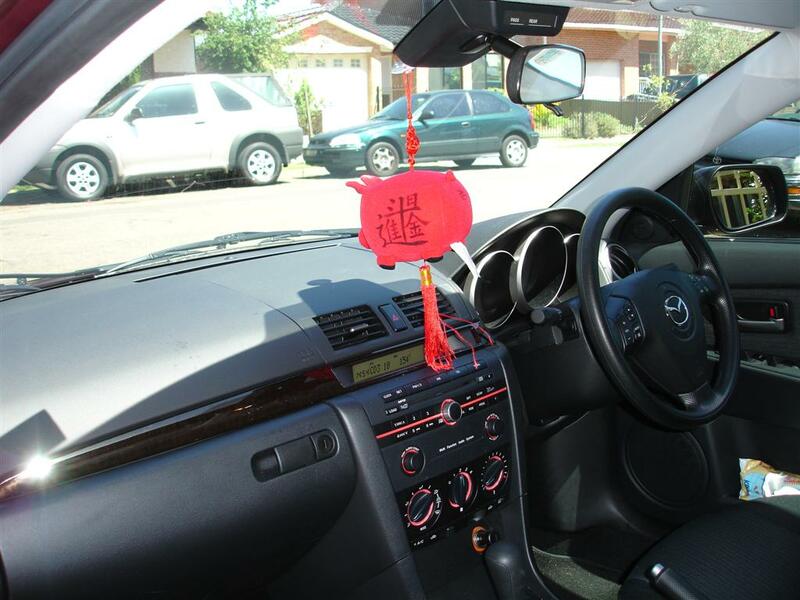 There are 3 quality levels to choose from :- Mobile, Standard and Maximum. The mesh I ended up with looked good enough so there wasn’t a need for me to bump it up to 11. Now you can export that as an OBJ file! But but but… there are holes in it! Because I couldn’t take photos of the underside of its feet, the mesh is non-manifold and there are these humongous holes under his feet! So the mesh isn’t perfect and that’s where Meshmixer comes in. 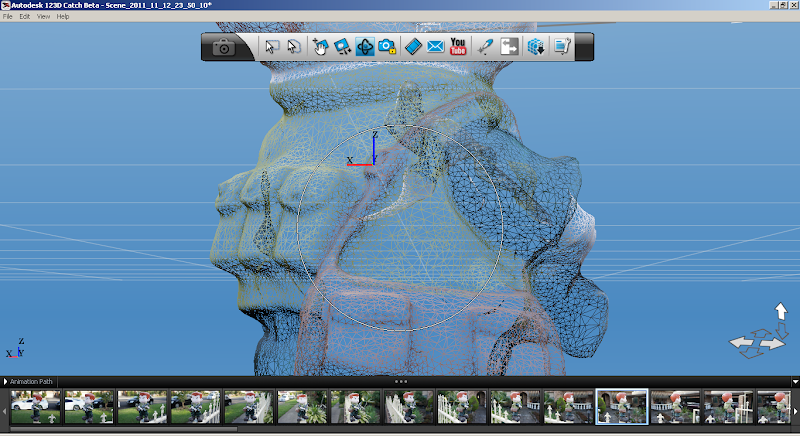 Opening the model in Meshmixer helpfully shows and highlights the problem areas with a big blue/red outline as you can see above. Removing the hole was simple, Meshmixer has a tool called ‘Erase & Fill’ where it will delete off selected portions and fill it in to make a solid. i.e. you need to select around the edge/bottom part of the shoes, delete and it will fill it in. You’ll need to edit the tool because the default fill is a huge ‘bulb’/’balloon’. There are some other useful tools in meshmixer such as the smooth tool to smooth out bumps that might appear here and there but once the model is ‘solid’ it is ready for print. 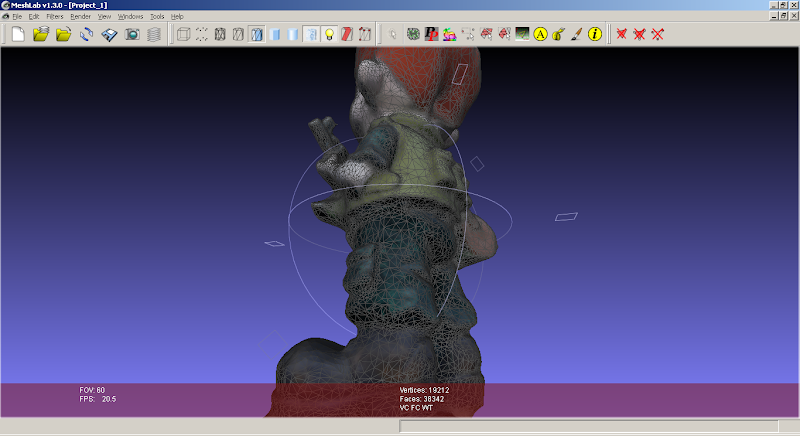 Meshmixer lets you export direct to STL and its straight to the printer! Catch seems to be getting better results than photofly did. I uploaded a set for a small figure as well, and Catch did much better with it than Agisoft Photoscan, which had previously been the best I found. I’m impressed at how well it captured the flat painted plastic areas, which is usually pretty challenging for photogrammetry. I’m going to give a few of the other services like hypr3d a go with the same data set and do a comparison later, but for now Catch seems easiest to use. Very cool, nice results, makes me want to try it! Was thinking about how I would go about photographing a sculpture I made of Abe Lincoln in sculpey. Rather than move camera…Am going to put it on a lazy Susan and turn it what? 20 – 30 times. You could even lay your fellow in demo on his back and rotate lazy Susan again to get head n feet. Then i am going to print him with the Printrbot! Actually it is recommended NOT to use a Lazy Susan as it confuses the software. I had the same idea before and the results don’t look as good as not using it (as they recommend/suggest). Interesting cause it just seems easier to move object. What about lighting or would my carport in daytime work? I did back the Printerbot!! Sooo excited. Want to print prototypes before sending to Shapeways. The UP was my next choice. I see you sell them (I am in USA). Would still be interested in your experiences.